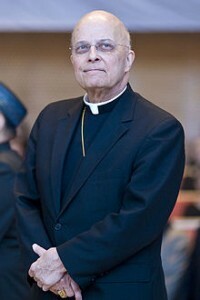 I am calling on Chicago Archbishop Cardinal Francis George to step down for his hideous and hurtful comparison of the LGBT community to the Ku Klux Klan. How could a sane human being place law-abiding, peaceful citizens in the same category as a notoriously violent hate group? Clearly, he has crossed so far over the line of basic decency that he couldn’t see it with a pair of binoculars. George’s bizarre and radical remarks were so “out there” that they undermined his credibility and permanently degraded his ability to serve as a public figure and as a respected voice of reason. George’s statement was so extreme that apologizing will not be sufficient. The Cardinal’s only road to redemption is handing in his resignation. If he has a shred of dignity and a sliver of class he will immediately step down. If the Roman Catholic Church truly stands for the dignity and respect of all people, they will immediately ask George to leave his post.